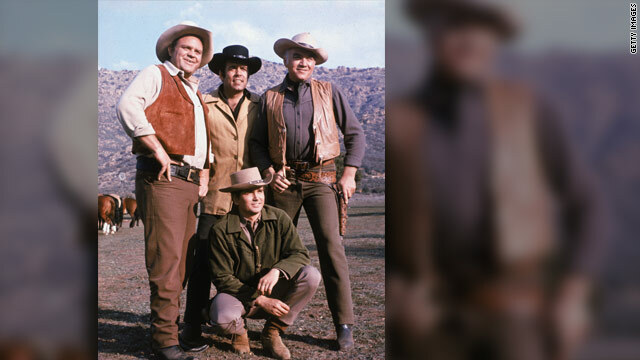 Pernell Roberts, standing at center, co-starred in "Bonanza" with Dan Blocker, left, Lorne Greene, right, and Michael Landon. Los Angeles, California (CNN) -- Actor Pernell Roberts, who played the eldest Cartwright brother in TV's "Bonanza," died at his Malibu, California, home Sunday at 81, his lawyer said. Younger TV viewers may remember Roberts from the lead role in "Trapper John, M.D.," a medical drama that aired on CBS for seven years, ending in 1986. Roberts, a native of Waycross, Georgia, spent much of his adult life "pursuing his dream of equality for all," according to a family statement released by his lawyer, Richard Stone. Roberts spent the first decade of his acting career on stage -- including Broadway -- before he moved to Hollywood to act in movies. His first film was "Desire Under the Elms," starring Sophia Loren and Burl Ives. In 1959, he landed the role of Adam Cartwright, the handsome and smart son of rancher Ben Cartwright (Lorne Greene) in the new western series "Bonanza." His character was serious and introspective, in contrast to younger half-brothers Hoss (Dan Blocker) and Little Joe (Michael Landon). Roberts walked alongside the Rev. Martin Luther King Jr. in the historic 1965 march from Selma to Montgomery in Alabama, the family said. "On the set of 'Bonanza,' he protested the use of all white crews and guest stars, finding some support but never enough to satisfy his sense of outrage," the statement said. Roberts left the popular western after the end of the sixth season in 1965, although "Bonanza" stayed in production for another eight years. While the show's storyline kept open the possibility of his return to the Ponderosa ranch, Roberts never did. He never gained much of a foothold in film, but stage acting kept Roberts busy for more than a decade. His role of Dr. "Trapper" John McIntyre, starting in 1979, was a spin-off of a character from the hit TV comedy "M*A*S*H."
Roberts played the balding physician working in a San Francisco hospital nearly three decades after he returned from the Korean War. His last regular TV job was in 1991 when he was host of the short-lived ABC police anthology "FBI: The Untold Stories."